Time is one of the most precious treasures of life that is severely limited every day. No matter how rich you are or how wise you are, you cannot extend 24 hours by even a speck of a second. Efficiency is the only factor that can enhance your productivity in the limited amount of time that you are blessed with in a day. Communication over phone being a part of our daily process, apart from talking on phone the overhead cost of time is the tapping of numbers on the keypad or searching the name to call and sliding the finger across. This process consumes focus as well as time. What if both these could be saved for you on certain big occasions and amidst tight time and busy schedules? Here comes the solution in the name of Group call for the entire world. 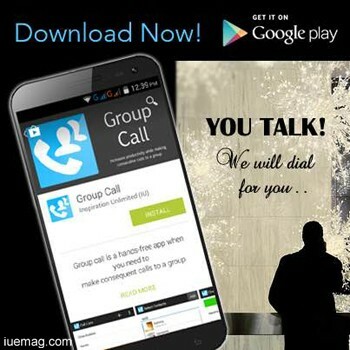 "Group call app acts as a hands-free when you need to make consequent calls to a group of people. All you need to do is create a new list, add the people from your contact list and click one button. The app starts calling one contact after the other without your intervention. 'Pause', 'Resume' and 'Stop' are some of the options you can use. 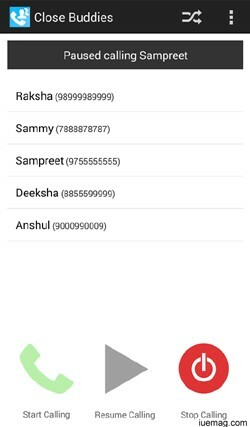 You can shuffle the list, call from a contact in between and add new contacts in between. Birthday parties, Event Invites, Marriage invitations, Daily calls to your teams, Follow up calls to clients, Client relation calls, Monthly call to all your friends, or Just anything about a group - Make a list and never bother yourself again when it comes to calling them in a sequence. One button and you just need to go on TALKING! Keep the MAIN THING the MAIN THING - YOU TALK! We will dial for you..."
Install the app, add your list to be called, play the app and continue your work. While your earphones or Bluetooth headset is connected to your smartphone, you are completely hands-free. While your vocal cords are busy talking to your friends and family, you are totally free to concentrate on your driving or do other household work or work on your laptops. You are completely relieved of the thinking process of whom to call next and you tend to get more relaxed in your conversations. You don't have to pick up the phone after every call to search for the next name and dial. You buy peace of mind along with this free app. Isn't that a fair deal! Truly a must for daily call with team!!! I must say, it's a very thought through app so simple and easy to use. I loved the UI and the features provided. Cheers! Work becomes easier! I have a set of calls that needs to be made every day. I had to search for every name in my contact and sometimes I would forget a couple of them. Now this app has taken the responsibility to remember them! Thanks a lot for the app! https://play.google.com/store/apps/details?id=com.group.call&hl=en is the link to download your Group Call right now! Watch out for more exciting features that shall be added soon. Not to forget to mention that this free app is completely ads-free just like how we love you to enjoy your life hands-free. We hope that this app will definitely make you happy by relieving your work to some extent and make you feel livelier. If you're happy we are sure that you will make more people in your surroundings happy and the perpetual effect shall continue leading to a happier world. 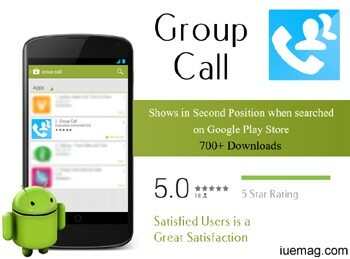 Hence Group Call is known as the most awaited app for a happier world. Any facts, figures or references stated here are made by the author & don't reflect the endorsement of iU at all times unless otherwise drafted by official staff at iU. This article was first published here on 20th September 2014.